Kerstin Anita Marianne Ekberg (29 September 1931 – 11 January 2015) was a Swedish actress. She was born in Malmö, Skåne. She was best known for her role in the movie La Dolce Vita (1960), which was directed by Federico Fellini. 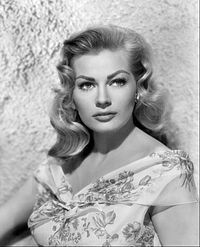 Ekberg died from a long-illness in Castelli Romani, Italy, aged 83. ↑ "Skådespelerskan Anita Ekberg är död". Expressen. Retrieved 11 January 2015. ↑ "BBC News - La Dolce Vita star Anita Ekberg dies". BBC News. Retrieved 11 January 2015. This page was last changed on 20 June 2018, at 02:53.